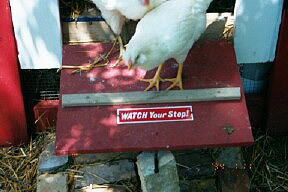 "My chickens were having a hard time getting in and out of their coop; the slanted door was like a slippery slope. Then my husband put a "rung" on it to help them, and I posted this sign to remind them to be careful as they enter and exit. As you can see, each time they negotiate the door, they stop to read the sign. Quite remarkable, wouldn't you say? And people have the nerve to say that chickens are stupid. Puh-leeze! 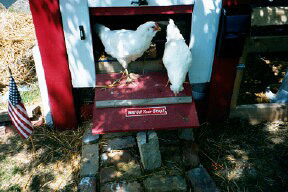 My chickens also have a mailbox (yes, they have received 2 pieces of mail from friends) and a doorbell, which has become all the rage in modern coops. 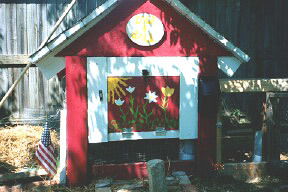 I also decorate their "yard" with flags and artificial flowers, whatever is seasonally appropriate." "Cute, would like to see more"